Growing the family business can be a noble cause. For Danny Zaslavsky, General Manager at Country Hill Motors, it’s a mission. Danny has helped grow his family’s business into one of the region’s most successful independent auto dealerships. But it hasn’t come easy. Success in the car business requires vision and tenacity. Late last year, Danny sat down with us to talk about how his dealership, and how he has used V.A.N. to increase its local visibility, and boost sales. Specifically, through quality used vehicle acquisitions. Q: What was your goal when launching the Vehicle Buy Center? DZ: The goal that we had originally was to purchase a hundred cars a month, within a year’s time. We started with purchasing 10 cars a month. That department has now grown to four and a half employees, and our best months so far has been a little over 50 car parts. So we’re halfway there. Q: How has V.A.N. been instrumental for you? DZ: A lot of the coaching that you guys gave us was really accurate You know, the first communication that we have with the customer a lot of times the customer is just trying to get a feel for the market and understand what their value is. They may start at a higher price, so staying on them and continuing to work with them is really important to actually make that acquisition. A lot of times we don’t make the acquisition the first day that the customer communicates with us. 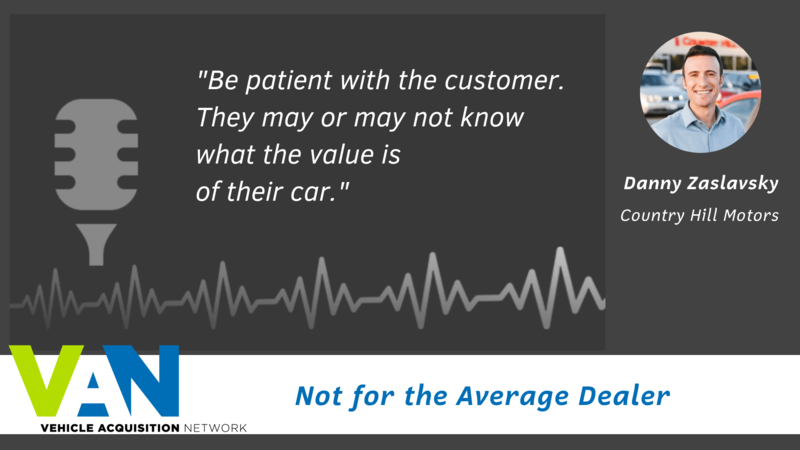 Often it may take a week or two weeks or even three weeks to continue a conversation with that customer. Q: How has V.A.N. helped with inventory? DZ: Because of V.A.N., we’ve gotten to purchase some completely unique cars – Hummer H1s, Corvettes and Porsches … we purchased a Volkswagen Thing. All sorts of really unique cars that we can then turn around and offer to the public which makes us stand out more in the community. Q: Are there any particular Best Practices you can share? DZ: One of the ones that I think is really important is to make sure to be patient with the customer. Keep in mind when you are communicating with the customer the first thing you’re doing is saying ‘We’d like to make you an offer on a vehicle that you have. If you’re interested in that offer’ or ‘Give us a ring’. When that customer then inevitably messages you, be patient with the customer because they may or may not know what the value of their car is. We, as the experts, want to be able to walk them walk them down that path patiently and kindly. Q: Why do you recommend V.A.N.? DZ: I would absolutely recommend V.A.N. to any dealership that’s looking for ways to increase the average gross per copy that they’re making on cars. Because today, going to the auction and being the last person raising your hand to purchase a car also means that you paid the most. So by making good acquisitions from the public, doing it in a way where you have the time to inspect the vehicle – have your service department look at it, see if that’s a vehicle that you actually want to purchase – sit down, negotiate with the customer, purchase the vehicle and then recondition it to put it on your lot for sale; you will certainly see that your average gross per copy goes up. Want to hear more about how dealers are using VAN to acquire used vehicles from private sellers and build profitable buy centers? View the Testimonials section on our website. When you’re trying to keep your pre-owned lot stocked with high-quality, in-demand vehicles, dealing with auctions can be costly and time-consuming, plus you always risk having your price bid up by competing dealers. With VAN you go straight to the source, acquiring pre-owned vehicles directly from private sellers in your target market. The Vehicle Acquisition Network saves you time and money by automatically searching online listings to locate your most sought-after units from independent sellers in your area. Find the pre-owned vehicles you want faster than your competitors for hundreds less than you would pay at auction. Get your free marketing analysis today!